Colorado Coalition of Massage Therapists (CCMT) is a multifaceted collaboration of representatives of the American Massage Therapy Association (AMTA), Associated Bodywork and Massage Professionals (ABMP), Colorado massage schools, and a fluid webbing of participating volunteers. 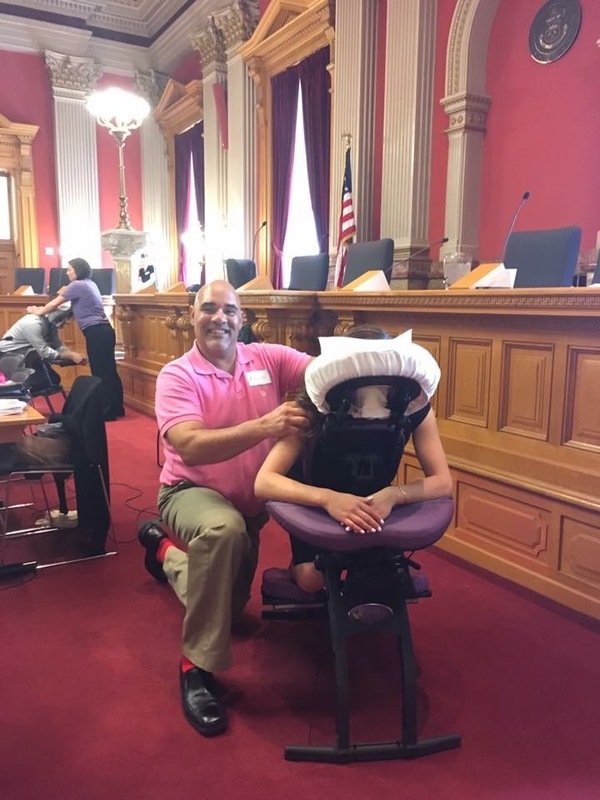 CCMT is accessible to consider a collective response to legislative and regulatory activity impacting Colorado Licensed Massage Therapists (LMT). CCMT maintains CCMTonline.com to serve as a clearinghouse for general public information; communication efforts are further supported by the Legislative Alert Network (LAN) and the CCMT Facebook page. Time: Volunteer for all or part of the time period between 8:30 a.m. and 1:30 p.m.
We ask that you commit to volunteering for at least 2.5 hours, if your schedule allows. CCMT has sponsored Massage Therapy Legislative Awareness Day at the Capitol each year since 2003. 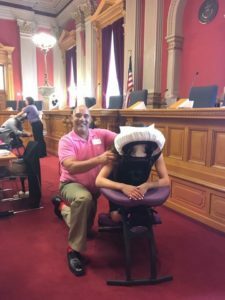 This event brings licensed massage therapists to the State Capitol to provide chair massage to legislators and their staff. The MTLAD serves a dual purpose: creating a positive image of our profession with law makers, and to make influential contacts in the legislature. The AMTA Colorado Chapter and ABMP have used lobbyists for many years to advocate and work on behalf of our profession with the state legislature. CCMT Legislative Alert Network – Subscribe to email notices monitoring active legislative issues. DORA Office of Massage Therapy Licensure – Provides general information and links to current statutes and rules. DORA Alerts – Subscribe to email notices of alerts issued by the Office of Massage Therapy Licensure. DORA Regulatory Notices – Subscribe to email notices whenever a draft proposed rule or amendment to an existing rule is submitted for review. Act • Legislation enacted into law. • A bill which has been approved by both houses of the General Assembly and has become a law either with or without the Governor's signature. Amendment • Any alteration made to a bill, resolution, or memorial offered by an individual member either in committee or on the floor of the legislative house. Bill • Draft of a proposed law presented to the legislature for consideration. C.R.S. • Abbreviation for Colorado Revised Statutes, which is the compilation of Colorado laws. • An administrative rule is a general statement adopted by an agency to make the law it enforces or administers more specific or to govern the agency's organization or procedure. • Administrative rules have the force and effect of law. Statute • A particular law enacted by the legislature. Sunset • The periodic review of statutes controlling advisory committees and agencies exercising the state's power for regulation. • Committees and agencies under sunset are terminated automatically by specific dates unless their life has been extended by legislative action. Statute • Enacted by legislation. • Requires new legislation to be introduced to amend. • Statute provides authority to an agency to promulgate rules. Force Status • Law. • An agency rule that is adopted under rulemaking provisions of has the force and effect of law.